All About Fish - Tips & Benefits! Lean protein should be the cornerstone of any good bodybuilding diet with fish at the top of the list. I've put together a list of types of fish, their benefits and included some tips on storing and safety. Get fresh fish now! Tired of chicken and tuna? Your diet doesn't have to be the same old boring thing day after day. With the proper knowledge of cooking techniques you can add some variety to your menu without sacrificing excellent nutrition. Far too often those of us who are trying to eat clean find ourselves stuck in a rut. This is the number one factor that leads to a loss of willpower and an all out binge at the local buffet. If you provide your taste buds with enough excitement on an everyday basis, you won't feel near the need to indulge elsewhere. Everyone knows that lean protein should be the cornerstone of any good bodybuilding diet. Unfortunately, if body fat is a concern for you, this will eliminate many tasty types of meat out there. One often forgotten about form of protein is fish. Sure, many of you eat canned tuna out the wazoo but forget that the real thing is so much better. Granted, fish does tend to be a little more costly than other sources of protein, but as long as you eat it in smaller servings and be sure to buy it when it goes on sale, you can enjoy it as a part of your regular diet. There are so many different types of fish out there it is hard to know which one you will like and what will match your needs the best. As you can see from above, pretty much all types of fish, with the exception of salmon and mackerel are virtually fat free. This makes fish one of the best foods for individuals who are preparing for a contest. Again from the description above, fish is very low in calories meaning you can allow room in your diet for other foods that add bulk. For example, since fish is carb-free (most varieties) you may be able to add a small side of brown rice or a small yam to your meal to make up for this difference. Keep your heart healthy by lowering triglycerides and reduce the risk of sudden death. Help promote healthy brain function. Are particularly good for pregnant women since they aid in the eye and brain development of the fetus. Top Selling Fish Oil Products Here. If you want to get the best tasting fish out there, it is by far preferable to buy it fresh from a local market on the same day you plan to cook it. If this is not an option for you, frozen fish can be used, or you can buy fish and store it properly until you consume it. 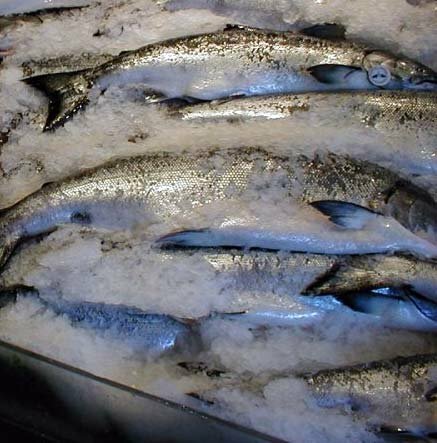 Here are some tips for choosing and storing fish safely. Look for a fish market where turnover is high. This will ensure you are getting fresh fish that hasn't been sitting in the store for a prolonged period of time. Ensure fish is packed in ice. Whenever you are shopping, only chose fish that is being stored on ice. This will ensure you do not risk food poisoning. Always Buy Fish Packed In Ice. When buying a steak or fillet of fish, the flesh should be firm to touch and moist in appearance. After you have purchased the fish, ensure you refrigerate it promptly and consume within 2 days. If you cannot consume it within 2 days, pack it in a vacuum sealed bag and place it in the freezer. When thawing frozen fish, thaw in the fridge and not on the counter. Never refreeze fish that was once frozen. If you choose to buy frozen fish, place immediately in the freezer once home; do not let sit on the counter or in the fridge. The final consideration to keep in mind is that there has recently been a lot of controversy of the mercury levels of fish. This is because it comes from bodies of water that contain both natural and unnatural contaminants. Toxicity from fish is very rare, however, you do need to be aware that consuming abnormally large doses of fish can put you at risk. The USDA recommends that in particular, pregnant women and children are very careful about fish servings, with special concern to those highest in mercury. Mercury & Tuna - Setting The Record Straight! Servings of these should be kept to about once per week. These can be eaten on a daily basis if wanted. So next time you are looking for a new dinner to prepare and are tired of your usual standbys, swing by the fresh fish aisle in the grocery store and pick up a variety of fish you've never tried before. Before you know it, you'll be hooked!